The series we now know as Formula One traces its roots back to 1906. Before the term, Formula One, was coined in 1950, essentially the same sequence of events were called the Grand Prix Series. But those words became bandied about so much that different ones were needed to describe the contest for the World Driving Championship. Nevertheless, each country’s race is still called a Grand Prix. The very first Grand Prix took place on June 26 and 27, 1906. 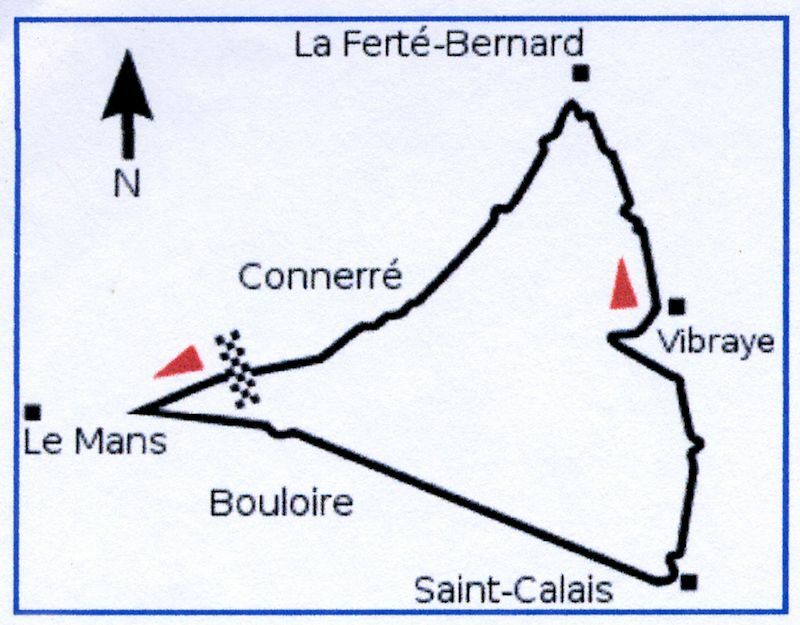 The venue was public roads in the vicinity of Le Mans, France near the Sarthe River, so it became known as the Sarthe Circuit. Previously, the only series that could be called international was the Gordon Bennett, established by James Gordon Bennett, Jr., owner of the New York Herald. (I touched on the Gordon Bennett in my July history column). Entrants came from a number of European countries that had national teams. Each country could enter only three cars and they had to be made in that country. There were no mechanical or physical limitations placed on the cars. At that time, France had quite a number of car makers and they objected to being allowed only three entries from each country. To top it off, the Germans got six because Mercedes had an additional factory in Austria. The new series—Grand Prix—had no such requirement. The cars, however, had to adhere to a formula. At the 1906, the cars couldn’t weigh more than 1,000 kilograms. Other than that, there were no other limitations. This first Grand Prix was organized by the Automobile Club of France (ACF) at the urging of French automakers. The city fathers of Le Mans and local hotels provided the necessary funding and persuaded the ACF to hold the race near the city. The course was laid out by the Automobile Club de la Sarthe over 64.11 miles of local roads. The route was roughly triangular with each leg approximately 20 miles long. Sharp corners were at the apexes of the triangle. The route ran just outside the village of Montfort towards Le Mans, but made a sharp turn before reaching it. Next it ran through Bouloire to Saint-Calais where it turned to Vibraye and on to La Ferté-Bernard and back towards Le Mans. When the route would have gone through some of the villages, temporary bypasses were constructed of wood planks. Some 40 miles of fencing was built at various points where spectators were expected to gather. The start-finish line was near Montfort where a grandstand that could accommodate some 2,000 spectators was built. The event was conducted over two days. Entrants did six laps each day covering a total distance of 769.36 miles. The road surface was the usual dirt of the time, so tar was applied to the entire length. Unfortunately, hot weather melted the tar and caused it to adhere to tires. 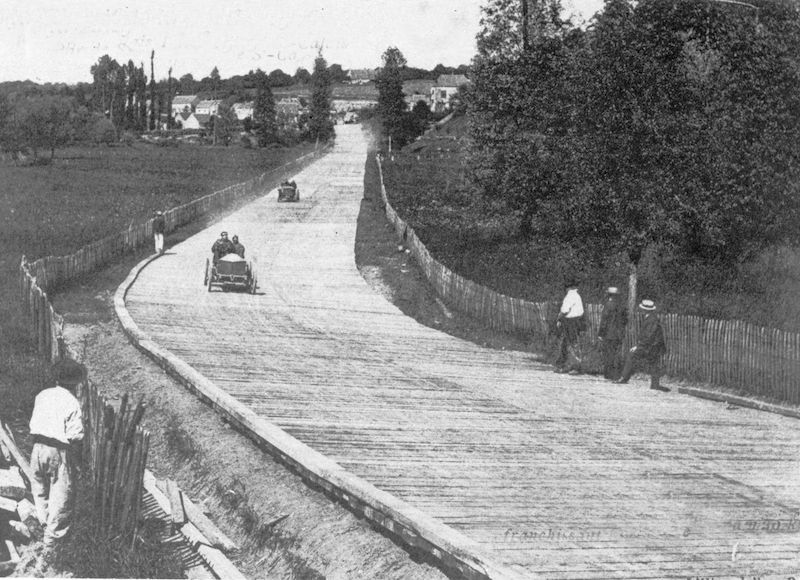 The race was not only between drivers, but also automakers. Cars were entered by Renault, FIAT, Panhard and Mercedes plus ten other manufacturers no longer in business. There were a total of 34 entries, but two failed to make the start. 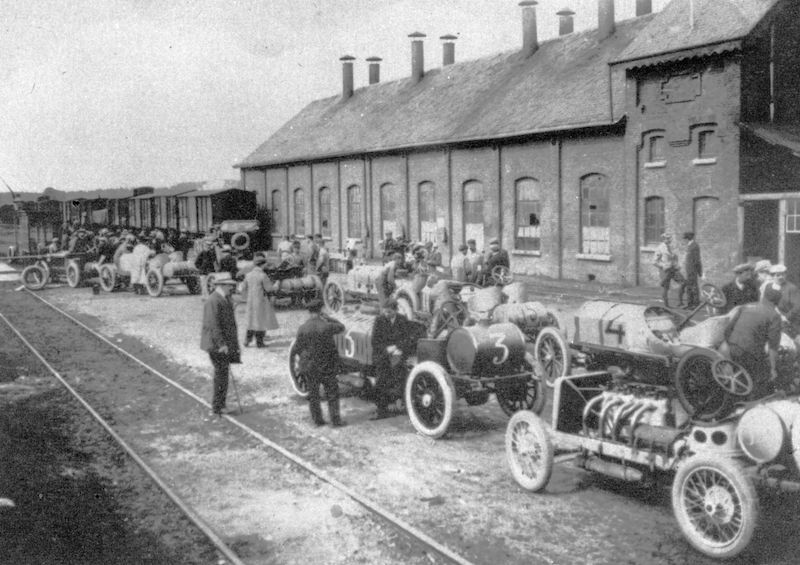 Twenty-three French, six Italian and three German cars started, one at a time, set off at 90-second intervals. This is the scene of the weighing-in (or pessage) that took place at the Bastogne railroad station. The only vehicle limitation (or formula) was a maximum weight of 1,000 kilograms or 2,205 pounds. The weighing-in excluded tools, upholstery, wings, lights and other light fittings. Those cars with a magneto were allowed an extra 15 pounds. Wooden passerelles or bypasses were intended to keep the cars from passing through the larger villages, this one at Ste Calais. The intent was to avoid the many spectator injuries experienced in previous events. Great story, I love to see these early racing history pieces! Thanks so much for this article and the photographs. Have passionately followed Formula One for over 30 years and shamefully did not know this part of it’s history. Well … this does not seem to be the first ‘Grand Prix’. According to Gerald Rose, A Record of Motor Racing 1894-1908, first published in1909, the first use of the term ‘Grand Prix’ for a motor race was the 1901 Grand Prix de Pau, held Feb. 17, 1901, 206 1/4 miles and won by M. Farman in a Panhard at46.1 mph.